Every second of our life keeps passing away much sooner than the tick of the clock and much faster than the speed with which we can realise that another second has been stripped away from our lives and another second we have moved closer to our death. This is a monotonous happening that has seen itself repeating millions of times since our birth that at times makes us wonder if we really have experienced something in our lives and if there is something at which we can look back in our lives and stare at and if nature has given us the time to accommodate some fun, excitement and happiness in this jam packed life. Often, these entities turn out to be the wonderful people we have met, we are meeting and we will continue to meet. They make our life more meaningful with their presence. They break the monotony of life, add milestones that help us keep track of our past and fill our lives with new lessons learnt that help us tackle the upcoming crisis in our lives in an even more efficient way. Some of them mirror life and its essence while a few others stand out as an example to show how one shouldn't lead his life. A few of them occupy a permanent residence in our grey matter as per our wish to recollect them and the interaction with them every moment for the birth of hope and love for the future and a few others too occupy the same inerasable area but with memories that keep haunting us and with memories which we wish could be get ridden off soon. These people with their diverse backgrounds, beliefs and habits are the ones that make up the most important part of one’s self written autobiography, either published or secured in the locker and so is it in my case too. It was around three to four years back that I was going to Mumbai to meet my friend and have a memorable time during my holidays. I have started from a remote village in Warangal to where I had been as a part of my industrial training. The weather at that time appeared so harsh that it seemed as if nature was mocking at me looking at my vain attempts to reach my destination at any cost even at that time when the winds seemed to be blowing so fiercely that they could uproot even the strongest tree and the downpour, so severe that it could inundate even the highest hill in the world. I first had to move to Hyderabad by bus and then catch a flight to Mumbai. I wished that nature would not pose similar problems at the airport too lest the flight be cancelled. But that would be a concern only when I would successfully reach Hyderabad. Owing to the fierce weather, there was no trace of even the one or two buses that could be occasionally spotted in that remote village. There was news that the path leading to the city had turned into a doorway to either hell or heaven with the asphalt eroded at several places, water flowing over it as if it was the river bed and uprooted trees scattered all over the path. The others who were waiting for the arrival of the bus appeared to lose hope and were thinking about their return to their houses and the postponement of their journey. But where was I to go? The village wasn’t the one where one could get accommodation in any of the several houses whose residents’ hearts are filled with compassion for a fellow human being. None of the houses in that village had either the space or the money to accommodate an extra person. Most of them were the ones living in absolute poverty. The one week of accommodation during my stay in that village was arranged with great difficulty and they appeared to smile more when I stepped out of their house than when I stepped in. There was nowhere I could go. I had to wait under the little metallic structure in the bus stop, not worthy to be called as a roof or a shelter. I haven’t eaten anything that day since the morning and nature seemed to trouble me even more with the passing of every second. One by one, every single person who had given me company since that morning set out for their houses to restart their journey on another day when everything turns normal. None of them had bothered to take me to their house even though they had been knowing me for the past seven days and well understood that no bus would be plying then to take me to my destination. I could have asked for help but I feared receiving a ‘no ‘as an answer, having an idea of their status that cannot provide shelter to even a single person for just one night. I had no option but to wait, wait and wait either till the time when a bus would come on its way to the village or till the time when I would embark on my journey to hell or heaven, with heaven being the most probable, unable to bear the extreme weather. The dilapidated structure could no longer resist the rain drops striking at high speed every second. It had collapsed with a thud and I was left to mercy drenching in the rain and shivering. It became too dark and the village boasted of the absence of electricity to even single household. Lanterns were all that could be spotted in the village during night time and they definitely would be of no use to someone standing in the rain and even if they were, I had to walk a great distance to fetch one with doubt if anyone would be willing to sacrifice one of their precious lanterns for a person whom they never knew or hardly knew about. The only source of light I was left with was my mobile phone and even that had warned me of a critical battery level. Two to three hours more a di would have to spend my life in complete darkness and would not be having a glimpse of the light atleast once even few minutes to see the time pass away. I felt that my end was drawing near and seated myself on the concrete bench. Till then, I had been standing, walking to and fro and straining my eyes every moment t so that I would not miss the bus that may or may not arrive. A few more minutes passed by and then I had the least idea of what had happened to me. I became unconscious. 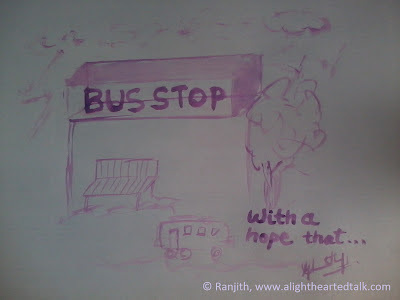 When I regained my senses, I found myself in bus and a co passenger was sitting beside me. Only two of the lights in the bugs were illuminated, most probably to save the fuel. All the widows were tightly shut to avoid rain and cold from entering inside but still they found their way inside and made the floor of the bus look like a marshy metallic land. Without bombarding any questions, the co-passenger smiled at me thereby forcing my sealed lips to unlock and return the smile as an appreciation of his work. He first handed over to me a glass of water and gave me some fruits to eat. Those few morsels of food tasted like a feast in a royal palace not just because of the long duration for which I hadn’t taken anything but also due to the love and care showered on me by that person. He seemed to be a very good person at heart. His eyes sparkled with joy whenever there was a smile on my lips and he looked as if he was eager to take my requests and cater to them. It was getting colder and colder and so I started shivering. Only when I started to shiver, I did notice that my clothes weren’t wet and that something had stripped my hair of the trickling drops of water. He was kind enough to lend me his sweater and blanket with which he was protecting himself from the fierce cold till then. It appeared to me as though he would sacrfficice anything and everything to make me comfortable. A few more minutes were spent exchanging smiles and then I thought that there was a need to ask who he was and how I was spotted and rescued lest an important part my life be left with no knowledge of what had taken and how it had taken place. Breaking the silence which was persistent since a very long time, I asked him who he was. Smiling again, he replied that I should know a great deal about him as I had been observing him for over thirty minutes. That was really an unexpected and an interesting answer. I tried to continue the conversation speaking some or the other not so meaningful things. The conversation seemed to go on the right track and with the last discomfort. During our conversation, I became aware of how I have landed in the bus, which I thought would never happen. I realised how lucky I was for the bus to pose a problem exactly at the place which had been my home for the past 8 to 9 hours. The bus had been moving at a very slow speed to avoid any problem that may arise in the not so good weather. The downpour increased further and the winds blew stronger and the sky reverberated with the sounds of thunder and the flashes of lightning but I felt safe in the presence of my friend- the co passenger whose name I never bothered to ask and whom I called a friend for natural reasons. The driver said that it would take another six hours for us to reach Hyderabad. As time passed by, conflicting feelings arose in me. On one hand, I wondered if I could live for another six hours in the darkness, only lightly illuminated by the two dim lights and on another hand, I felt that I had just six more hours left to spend with that new acquaintance of mine. I wanted every second of those six hours to be memorable. I wanted them to remain in my life as those moments when friendship was born and strengthened in a matter of a few hours. I wanted to know more about him and talk to him as much a possible but I had the last idea of how to talk and what to talk about. He asked me if I was feeling bored and when I replied in the positive, he suggested me to entertain myself with my phone. I wondered why he hadn’t proposed for a lively conversation and had opted for the phone instead. But I was lucky enough that I haven’t charged my phone for the past two or three days and as per the critical battery level indication in my phone that morning, the battery must have become totally exhausted. When I quoted the same with enthusiasm, he supressed my enthusiasm by saying that he had replaced the battery in my phone with his. Even before I dared to ask the reason as to why he has searched every luke and corner of my belongings, he said that he found the mobile switched off and so had replaced the battery so that any calls from my family members wouldn’t go unanswered. I never knew about friend who would think so much about the other’s wellbeing. When I had asked if he wouldn’t be missing the calls from his family members, he replied saying that it would be miracle if anyone would call him asking his whereabouts. On demanding clarity, he started telling more about himself, his life and his family. ‘Mine is a life just like any other person’s life in the world- The one that began with the cry as I stepped onto this earth and the one that would end with sobs and pain. Everything moved smoothly in my life until the birth of my second child. My family till then was composed of myself, my wife and my other child. But now, with the invasion of the new child, a happy family till then was torn apart. Unwanted and unnatural behaviour was noticed in my son since a very young age. On consulting a psychiatrist, we have been informed that he was suffering from some psychological problems. His behaviour used to be unusual. He would often not speak to anyone in the household properly and would hurt others even when he was as young as three years and find happiness in it. As he entered into his fifth year, his condition worsened even further and he behaved almost like a mentally retarded person. We had to lock him up in a room and leave him to his fate as we did not have the financial strength to bear the cost of the treatment. His life story was heart touching and the next few minutes, I spoke not a single word. The bus stopped at a dhaba. He got down and bought some food for me to eat. There was complete silence. I neither had the courage to restart the paused conversation nor the courage to switch his attention to a new topic. Many more obstacles came in our way. A couple of times, the road had been blocked by trees which have fallen down due to the storm. He managed to clear the path himself along with the driver and did not seek my help. Infact these obstacles were nothing when compared with what he had experienced in his life. Throughout the journey, no other passenger had got into the bus. Even when the clock struck twelve, I wasn’t feeling sleepy for I feared losing those few moments I can spend in his presence. But all that I could enjoy and experience was silence and nothing more. A few more hours and we reached our destination. He waved his hand and I too imitated his act. Even at that moment when we would be travelling along two different paths in life that that the least probability of converging, I remained silent and did not ask for nay of his details with which we could meet again. all i can say is all the best and hope you find your friend. all the best for the contest tooo ..
That was quite an adventure and a sad story. Very gripping narrative. Best of luck for the contest. A very different story, goose fleshed...appears as they say He, the Almighty, comes to rescue...has come down to rescue you..mythical but seems a little logical! Excellent narrative, Ranjith. Sometimes God does come to our rescue in the form of human beings. Meeting such strangers then is nothing short of a blessing, I feel. The sad part of course being, that we don't meet them ever again in our life, most of the times.. I don't know why..
That was a very intense story. It's one of those reminders that some good still exists in the world. You wrote from the heart and that matters a lot.....to me you are already a winner...all the best for the contest.I hope you will find your friend soon. A tale of two lovely souls- looks like you are destined to meet this "unknown " saviour by winning this contest! Simply and beautifully narrated. Hope you win. Good luck.